SOLD!!! back to its home in PA! California unit, ONE of 3666 units worldwide with a manual gearbox! **SOLD** 1992 850i Coupe 6-speed **One of the finest examples of an all original 12 cylinder 8-Series coupe!!! ** Fresh off the transport truck, California owned its entire life! This 850i coupe is one of 3666 in the world with a 6-speed manual transmission. Original and actual miles, red over black leather interior, all power options are in working order including all windows, moonroof, seats, & climate control. All original sheet metal, original interior, all original glass, inspected and ready for the road. ALL new fluids including fresh Liqui Moly oil change w/t filter and coolant. ALL new cooling parts including radiator, hoses and belts. 8-Series enthusiasts this has been an adult owned vehicle and it is 100% stock. IMPECCABLE! Books and two keys come with the vehicle. Must see to appreciate. Please call us at 630.482.5555 to schedule an appointment. For more pictures & details on this vehicle visit us online 24/7 at www.autosportgroupusa.com or call us at 630-482-5555 today to schedule your test drive. Autosport Inc. is not responsible for any listing errors, misc option, packages, and/or description. We reserve the right to terminate, sell, or modify any listing at anytime. 90 Day power-train warranty does not apply on all vehicles / or vehicles 12 years of age or older. Please call for further information. Sale price never includes IL Doc fee and all applicable taxes & licensing fees. 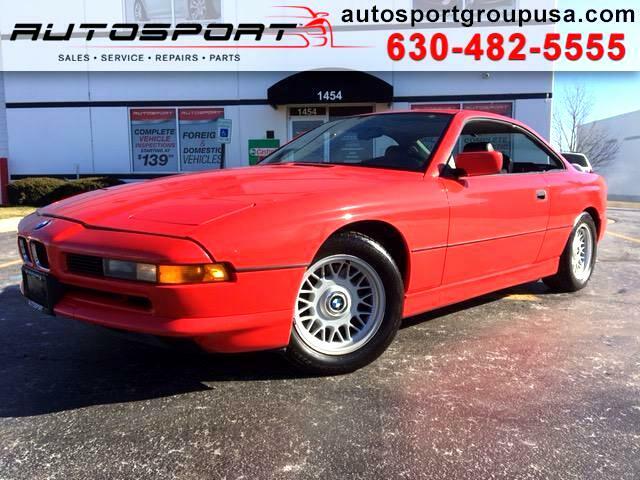 Message: Thought you might be interested in this 1992 BMW 8-Series.